Sell digital music at live gigs or promote your music affordably with CD Baby download cards and stickers. Download cards may be the best way to make your digital music instantly available to new fans. Carry them with you to hand out, use them as business cards, or sell them at gigs. People will be able to download your MP3s so you can sell your music wherever you go! CD Baby’s original music download card comes customized with your album art, artist name and album title. With Download Cards from Disc Makers now you can sell your music wherever you go! 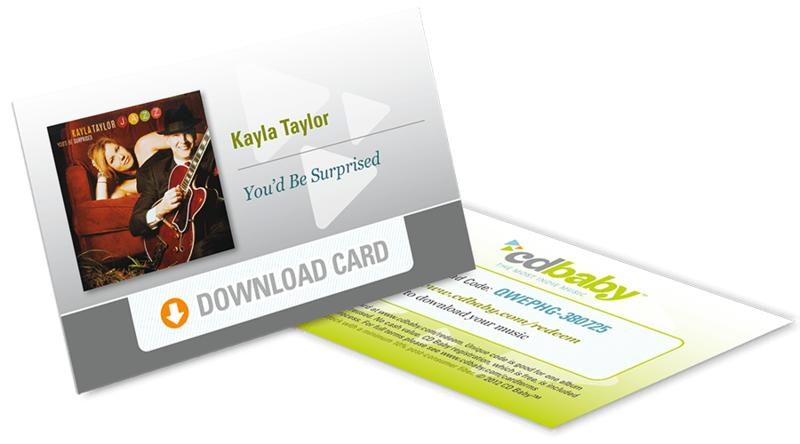 Music Download Cards are full-color cards that feature your album artwork and a unique code that allows users to download your album at CD Baby. You decide how much to sell the cards for (or give them away for free if you want to) and your customers can download your music at their leisure. Simply add standard download cards to your online quote if you are purchasing music distribution or call 1-800-468-9353 to speak to a Product Specialist to purchase additional styles. First, you need to have your music available for download at CD Baby. CD Baby memberships are available through Disc Makers (we include this in most of our bundle packages, like the Online Mega Bundle) or directly from CD Baby. Once you’re set up with CD Baby, you can sell or distribute your Download Cards to your fans. The back of the card includes instructions for the card holder to visit CDBaby.com, where they enter their card’s unique access code. That access code takes them to a page where they can easily download your album. Each card is valid for one complete album download, and cannot be reused once the album is downloaded.